It looks at the issues faced by large corporations when social media accounts steadily expand like Simon Cowell’s ego, creating lack of coordination and increased risk for social media crisis. How prevalent is this problem? Among the 140 global corporations studied for the report, they each have an average of 178 different social media accounts. 178! Here’s a little free tip from me. If your company has more social media accounts than the combined points scored in an average college basketball game, you need to get a handle on things, pronto. But yet, achieving that codification is proving to be quite a challenge. Just 48% of companies surveyed have a coordinated social media program across the enterprise. This means than for more than half of the biggest companies in the world, social media is somewhat of a free-for-all. It’s like a henhouse, but with Belgians engineers and Chilean customer service reps running around pecking at social media corn. The hen whisperer that’s supposed to make this all actually work is social media management software. An industry that’s positively Tebow-esque in its growth rate, social media management software helps companies find, triage, respond, post, and measure on the social Web. Perhaps the most well-known among the players – due to their wildly popular free version – is Hootsuite, but the report evaluates the strengths of 27 different options. “A Strategy for Managing Social Media Proliferation” makes clear that there is no perfect solution. No single social media management software does it all well, and perhaps that’s just fine. Maybe if we’re seeking a do-it-all solution, we’re asking the wrong question? It’s easy for companies to put the burden and blame on the software (and it is liberally applied in this report). But isn’t that confusing the wizard with the wand? It’s just software. It’s not artificial intelligence. It’s not all-knowing. At some level, it doesn’t MATTER which social media management software you choose, because you’ll get out of it what you put into it. Maybe these are not the droids you’re looking for? Instead of bemoaning the lack of the holy grail solution, companies (and not just big ones) need to instead realize that no software will be satisfactory when you don’t know what you actually want or need. My favorite finding in this study is that in 70% of the surved companies, social media efforts are meeting business objectives. Yet, only 43% have a formalized social media strategy that dictates HOW social media will meet business goals. Apparently then, in 27% of 140 major corporations social media meets business objectives because it “feels” like it does. Solid metric. Note to small and medium-sized business: you should not feel bad if you don’t have a social media strategic plan, et al yet. If the biggest companies in the world don’t have it licked yet, you’ve got time. Stop beating yourself up. Once companies have an actual social media strategy and defined success metrics, understanding precisely how social media management software helps achieve those objectives is the next critical step. 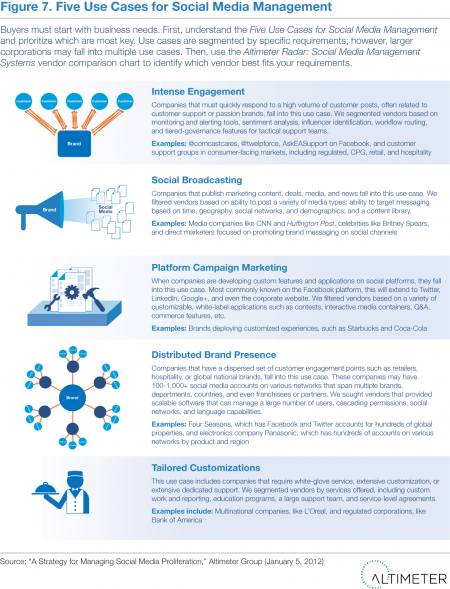 There is a tremendous amount of excellent information in the report but this “Five Use Cases for Social Media Management” is my favorite. It illustrates for what reason(s) social media management software might be necessary. Once you understand that, you can make a more intelligent decision about which software might be appropriate (using the nifty matrix provided by Altimeter). Social media isn’t about technology. Having a tool inherently gets you nothing but a monthly invoice. What you have is a chance to fundamentally change the way you do business, with a tool helping you get there. First, figure out how to be social as a company, then determine which social media management software is best suited to help you do social media.